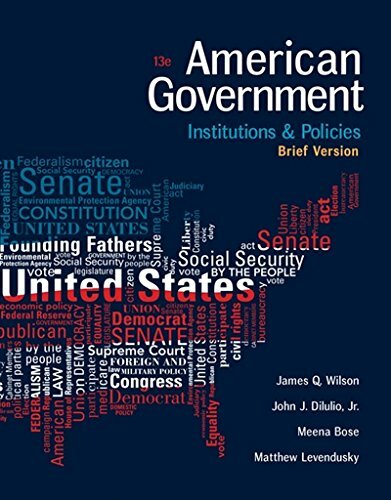 1305956346 -This popular brief text for the one-semester or one-quarter American Government course maintains the framework of the Wilson, DiIulio, Bose, and Levendusky comprehensive text, emphasizing the historical development of the American political system, who governs, and to what ends. The 13th edition of AMERICAN GOVERNMENT: INSTITUTIONS AND POLICIES, BRIEF VERSION, offers coverage of the 2014 and 2016 campaigns and elections; budget battles and the sequestration of funds; ongoing debates about immigration, gay marriage, and other key issues in American politics; and foreign-policy decisions on Afghanistan, the Middle East, and North Korea. We have also reworked each chapter to focus on a clear set of learning objectives to guide students through the material.